– A rain supreme. Not for hours or even days, but a full-on month of Old Testament downpour. The city gone intestinal: What were once yards, now a half-digested stew -- brown with mud and leaves in every direction. And what were once roads, now treacherous rinks for autoduel. The thought of riding a bike -- remote as it is for me already with such endless rain and off-season torpor -- it got a dagger in the heart this week thanks to this lung-clotting cold. Prenatally curled on the couch, I hack and blow and try to recall the muscularity of summer. It was more than just physical, it was mental hardness, too. There’s a jiggle there now -- mind and body both going marbleized. My October mileage log? It’s a study in minimalism. 31 days of house arrest, evermore distant from memories of power on a bike, of suffering on one, of even riding one. Another lesson, as if I needed it, of how perishable the rewards of training can be. Fitness fades so quickly, and in lockstep goes my sense of self-worth. – We spent the week curating conducting the voting process: PRO is permanent. – 2nd NASCAR reference in 3 weeks. And I don’t even follow NASCAR. But I’ve now been fully schooled on who Richard Petty is. Tifosi is tifosi, I suppose, no matter the sport. – More death in Senegal, unleashing the first salvo of VDBlack humor. – It’s almost time to start the ritualistic piling-on of early season base miles. Here’s some primo fodder for mid-ride discussion. FWIW, #55 on the Pitchfork list of the best albums of the 90’s is on my top-10 list of all time and if you ever visit Rapha in London you stay in Hoxton which happens to be the hometown of Spiritualized. – Rapha #2: We now have their silk scarf in stock and inspiration is a lovely thing. – Off-season is when you do customizations you just don’t have the time for in summertime. Here, a Cervélo P3 gets the business end of our power drill so we can run the battery cables internally and position the battery itself in a cleaner, more aero spot: Behind the seatpost. No one was hurt & only one warranty was violated in the making of these photos. – Got these snapshots this week and it either absolved me of my need to visit the 2010 NAHBS or it aroused such a re-appreciation of well-done steel that I won’t miss it for anything. 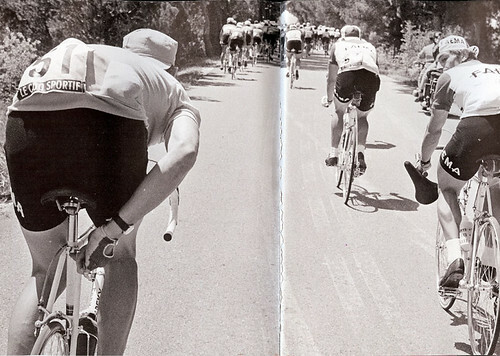 – Was told this week that this elusive book is the greatest one ever written about the Tour de France. Was told Fotheringham’s book on Coppi is phenomenal. Was told that the autobiography of Freddy Maertens is nothing short of spectacle. Cheapest one I can find online is like $200 -- does anyone have one to loan?